Einstein was perhaps the greatest theoretical physicist who ever lived, and his views on a wide range of other subjects provide food for thought. That doesn't mean he was right about everything. I mean, I wouldn't take relationship advice from the guy. But if he's right about this vegetarian thing, we're in a lot of trouble. There are too many others like me -- too desperately in love with meat to even think about saving life on this planet. In less gloomy and doomy news, I will say that I have appreciated some great and creative vegetarian dishes in my day. 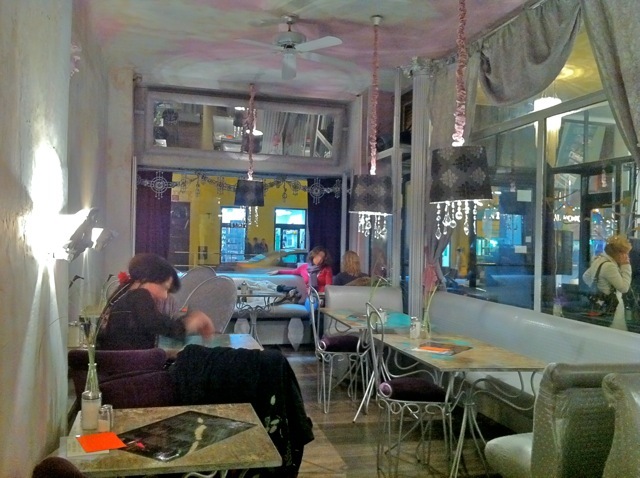 But vegetarian restaurants rarely pop into my mind when thinking about where to eat. I tried Maitrea and it was just OK. And yes, it's a glaring omission that I have never been to Lehka Hlava. 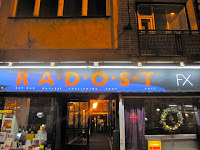 I also have been to Radost FX many times. But it had been a couple of years since I was there. 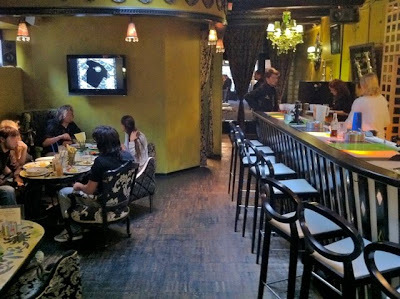 Recently, G-Man invited me to share a weekend brunch there with him and his daughter. 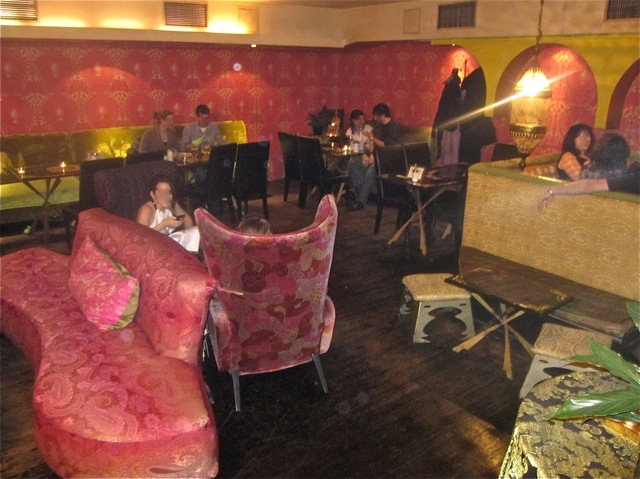 I do like the wild, worn, and eclectic interior design, with its electric green walls, green chandeliers, busy patterned chairs and couches, and gold-framed mirrors. 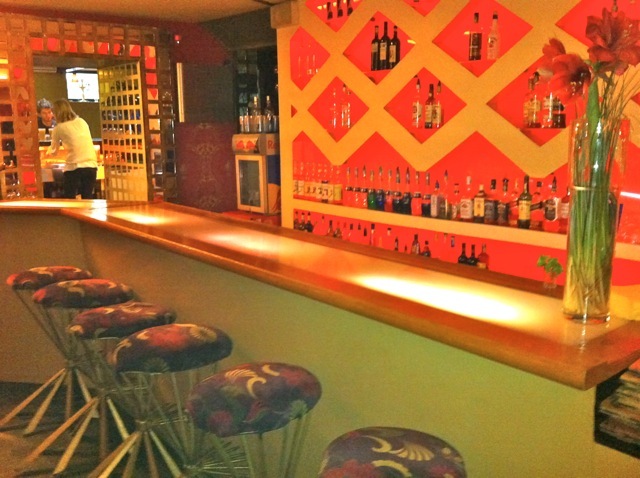 The back lounge area is a little more intense, with lots of red everywhere. Also dominating is the expat crowd. English is the language I've heard most often here, though patrons are certainly not all Americans and British. Some are also canines. These rooms can get quite smoky. 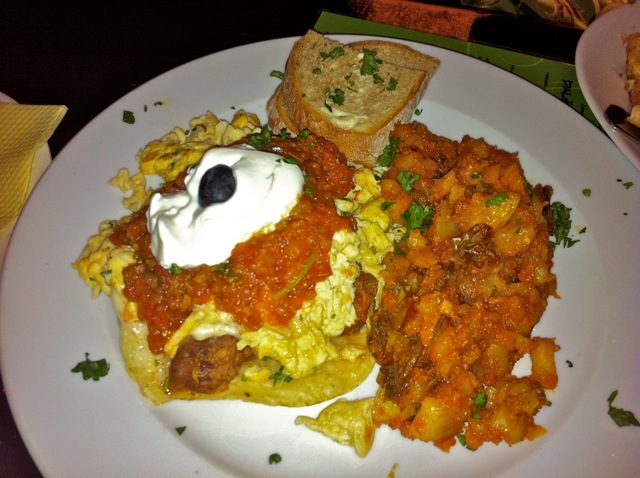 G-Man got the huevos rancheros (170 CZK). On the corn tortilla, there were refried beans, well-done scrambled eggs, cheese, a nice, chunky salsa, and sour cream. 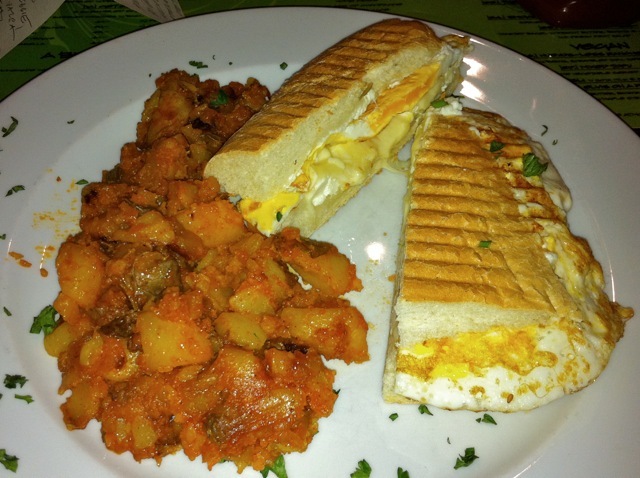 On the side there was a good potato hash and buttered toast. It's more standard to make huevos rancheros with fried eggs, but G-Man enjoyed it a lot. It's also quite filling. I felt like something a little simpler, so I ordered the egg sandwich with mozzarella cheese and jalapenos (155 CZK). It was just as I like it, with crunch grilled bread, hot, non-runny eggs, and fully melted cheese with the peppers mixed into it. 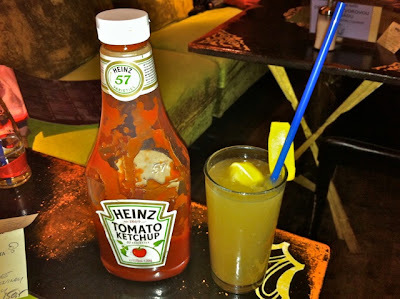 I like ketchup with my eggs, and the waitress gave me their huge bottle of Heinz. I put it next to my ginger lemonade for a size perspective. The drink had a large amount of fresh-grated, sharp ginger in it. The only issues were that the ginger kept clogging the straw, and I wished for more ice. 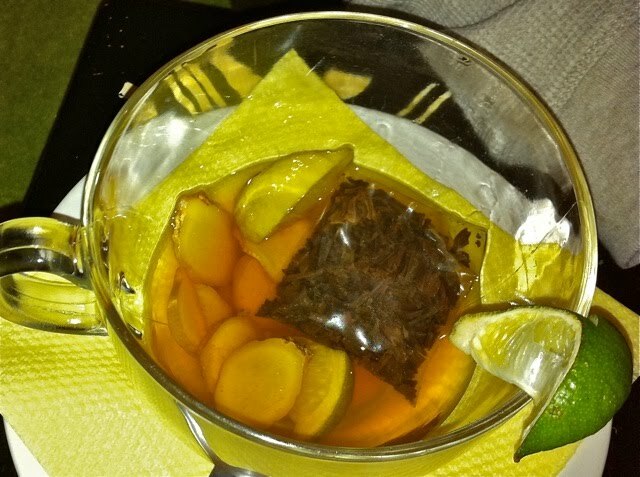 G-Man had a giant cup of black tea with ginger slices and lime. If you are not going with coffee, it definitely helps perk things up on a Sunday morning. It's a tasty beverage. 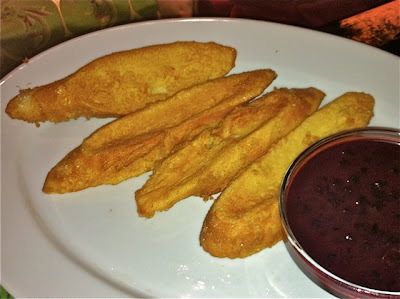 G-Man's daughter had the French toast with blueberry sauce (115 CZK). After daddy cut it up, she loved it. I thought the sliced and dipped baguette slices were a bit dry in the middle, and the egg mixture should have been allowed to soak in more. I enjoyed the breakfast so much, I decided I should return and try the regular menu. Although I'd been to the restaurant a number of times, I don't think I'd sampled many of their regular offerings besides the quesadillas and nachos. 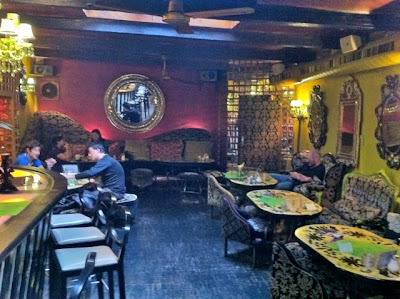 A few days later, I stopped by and sat in the non-smoking room at the front of the restaurant, looking out over the sidewalk. A couple of ladies sat down and lit up, and promptly were asked to move to the smoking area, which they apologetically and respectfully did. I ordered a beer. 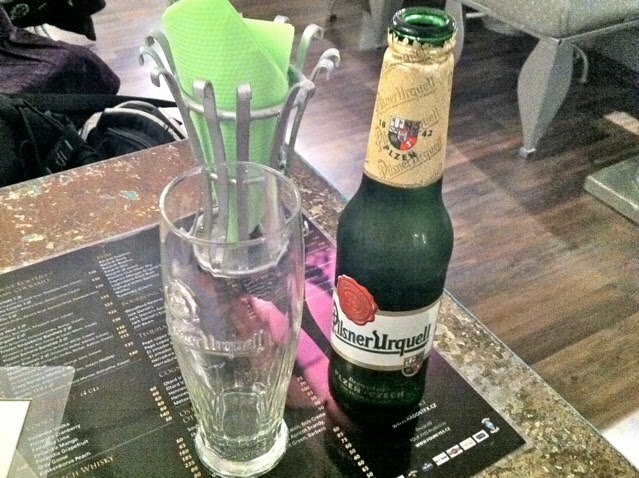 They only had small Pilsner Urquell bottles (35 CZK). For food, I started with the baked peppers stuffed with cheddar and jalapeňos (135 CZK). The very soft pepper was nearly flavorless, but the creamy cheese and spicy jalapeňos were delicious. It had a very light texture. 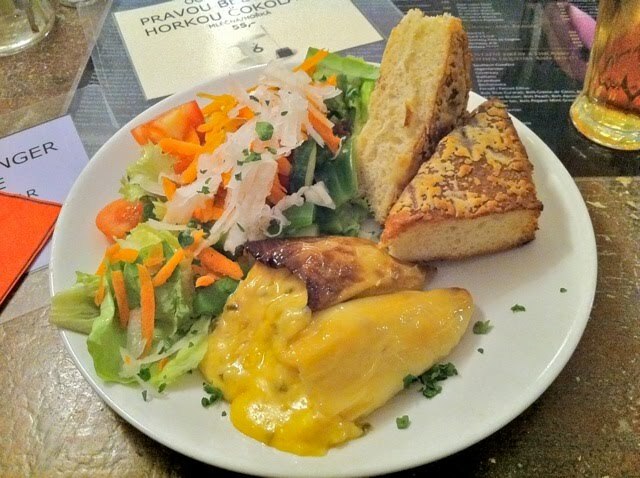 The warm Cheddar mixture was easy to spread on the focaccia-like grilled bread, which was also a wonderful surprise. The bread could have been an afterthought. But this warm, light, fluffy and crunchy stuff was a pleasure. The combination was great. This dish was almost a meal in itself, but I wanted to try the "Salad in the City" (175 CZK). 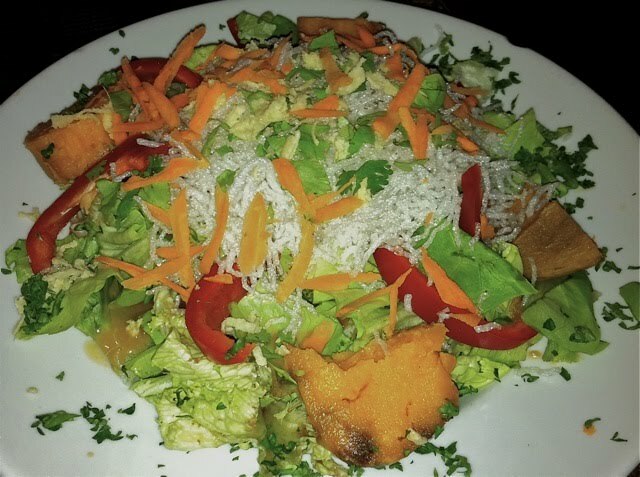 The big plate was filled with mixed greens, rice noodles, red peppers, carrots, sweet potatoes, and cilantro. The salad was a mixed bag. I especially loved the four big chunks of sweet potato. They were very sweet, with a smooth texture. The peanut dressing was spicy, tangy, and very sweet. I liked it, but I can imagine some might find it cloying. On the downside, the menu said it was topped with nuts, but I didn't see too many. The lettuce could have been crisper. But the biggest problem was those noodles. They were stale and tough to chew. It would have been much better without them. Still, I liked both dishes enough that I decided I wanted to try more of the menu. I returned for a third and final time for a quick meal with the English Patient. I had the "Up in Smoke" sandwich (165 CZK). 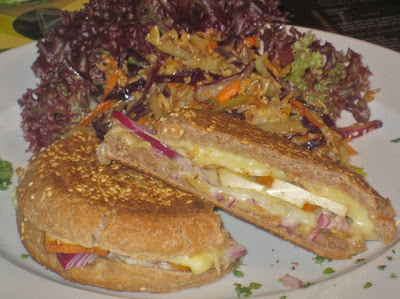 It is billed as "an FX Reuben sandwich that comes with smoked tofu, Swiss cheese, red onion, and Russian dressing with "crack slaw" on the side. It had no real connection to the name "Reuben" and was just OK. A lot of the flavors blended together and were lost. It tasted basically like a grilled onion and Swiss. 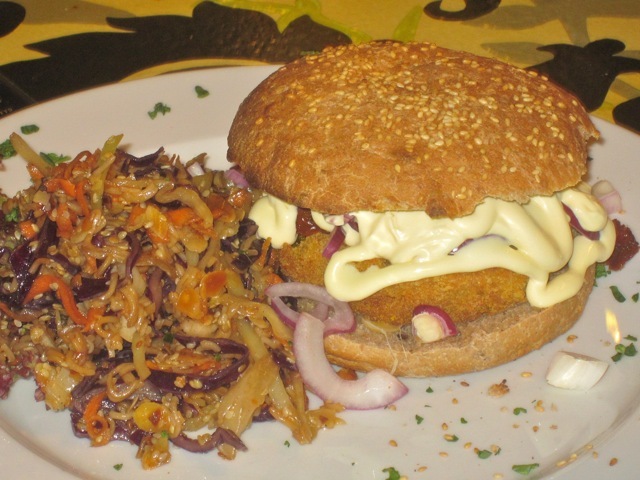 Much better was the English Patient's "McLentils Burger" (180 CZK). It was made with red lentils, leeks, tofu, ginger, cilantro and red pepper. I took a bite and was very pleased with the moist, flavorful patty and its crisp exterior. The crunchy slaw that came with both dishes was excellent. The only faux pas here was someone in the kitchen drowned the "burger" in mayo before sending it out. 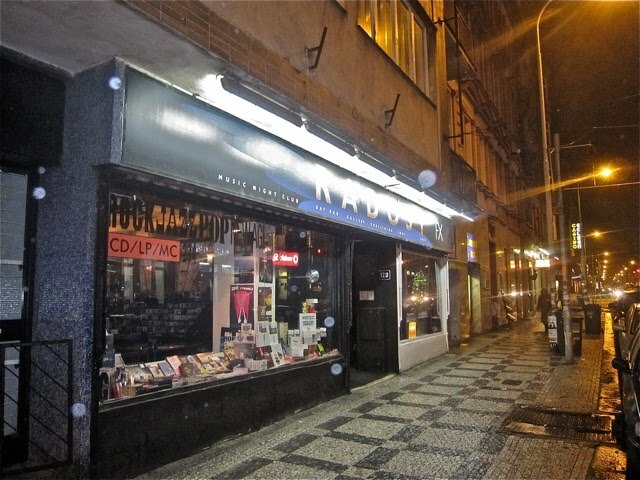 I'd been aware of and occasionally patronized Radost FX for many years without thinking too deeply about the place. 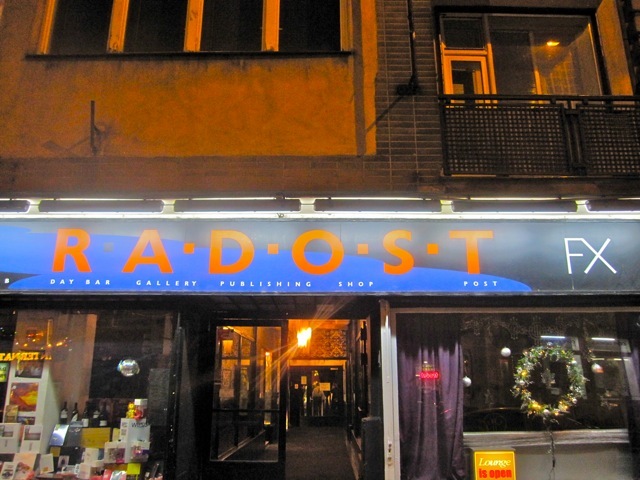 But I'll confess surprise at how much I enjoyed the food at Radost FX. Not everything was genius, but these meals brought about a relative evolution in my thinking about vegetarian restaurants. Or at least this one, anyway.